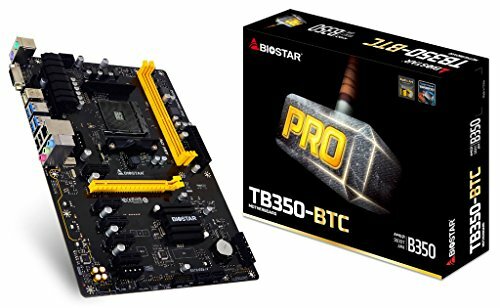 BIOSTAR is thrilled to welcome the latest addition to its expanding lineup of specialized cryptocurrency mining motherboard with the introduction of the BIOSTAR TB350-BTC. This motherboard supports AMD's latest AM4 socket designed to work with the latest AMD AM4 APUs. With Bitcoin mining retaking a more attractive pricing lately, both old and new miners are still seeking ways to improve the efficiency and performance of their mining systems. Add to this the addition of other cryptocurrency like Ethereum, Zcash and more which have provided so much more for the mining community to work with. With new GPUs offering more efficiency than previous generation, more GPUs can now be utilized for faster ROI. This trend in utilizing multiple VGA cards can cause extremely hot operating conditions which may affect system stability which may lead to operation disruption with breakdowns and failures.The distance between the PCI slots are a standard distance. These motherboards are used for 6 graphics cards and require advanced customer knowledge of computers on how to configure settings in order to use that many graphics cards. 6 PCI Express slots mining motherboard.